When a runner becomes injured and can no longer do the one thing she loves most, not only does the muscle begin to deteriorate but the mind starts slipping as well…How does the normal population LIVE without running? Are all the non-runners out there as depressed as I am right now?? These are the questions I began asking myself last summer as I struggled to get back up and running after my stress fracture. I thought I was beginning to lose it – That is, until I saw Gone Girl and breathed a sigh of relief….Me, I’m fine, but that chick, now SHE’s got problems. Still, I knew I needed something to fill the void of not being able to train for a fall marathon. I needed a project. I bought my 1928 bungalow about two years previously. 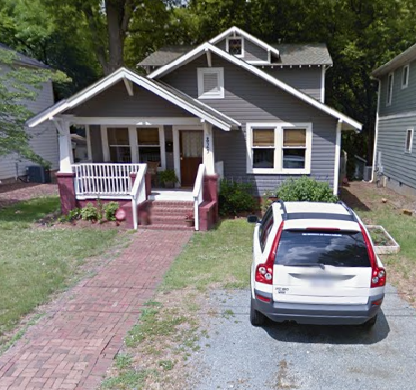 It was a foreclosure property and while structurally my home was as strong as the three little pig’s red brick house, some of the aesthetics were less than pleasing. Since I figured it was only a matter of time before my neighbors started complaining about how I just parked my car in the weeds (calling it “grass” would have been a compliment), I decided something had to be done about my front yard. 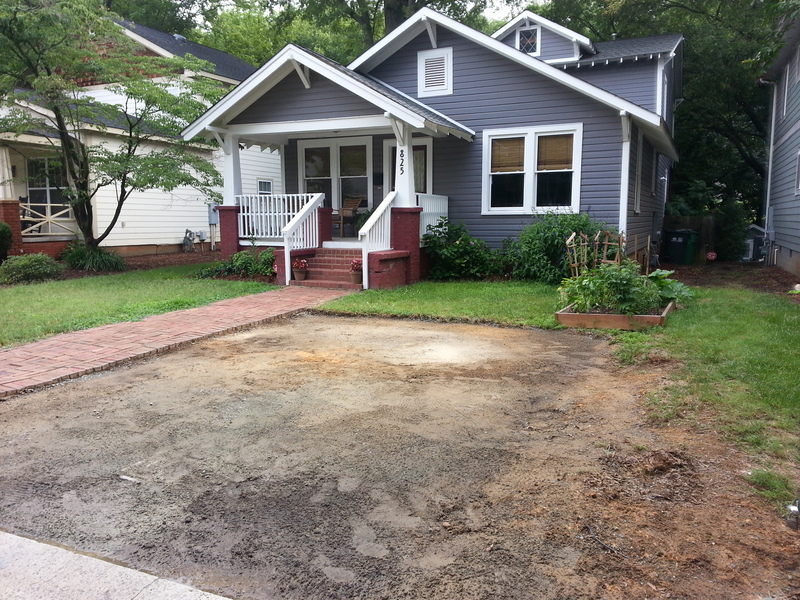 I toyed with the idea of doing a brick paver parking spot, but since there really isn’t enough space on either side of my house for a driveway, I was afraid a parking spot would throw off the balance of the bungalow. The truth is that my 1920s home and lot was not designed to have off-street parking. I have a brick walkway to the street…The original owner, most-likely an upper-class mill worker or shop owner of one of the stores in the strip of businesses that at one time joined two thriving mill villages, probably walked to work each morning. 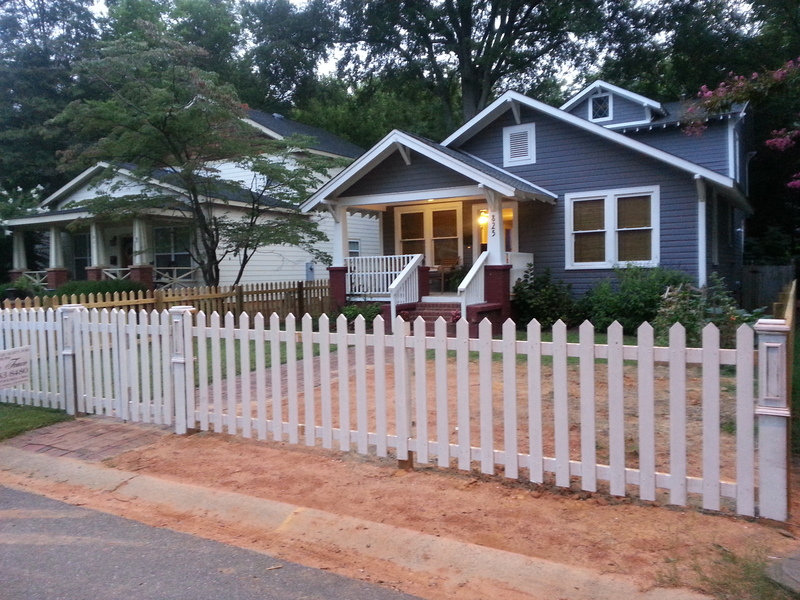 So, after much debating, I decided to give up my sweet parking space and put up a picket fence to encompass my entire front yard. 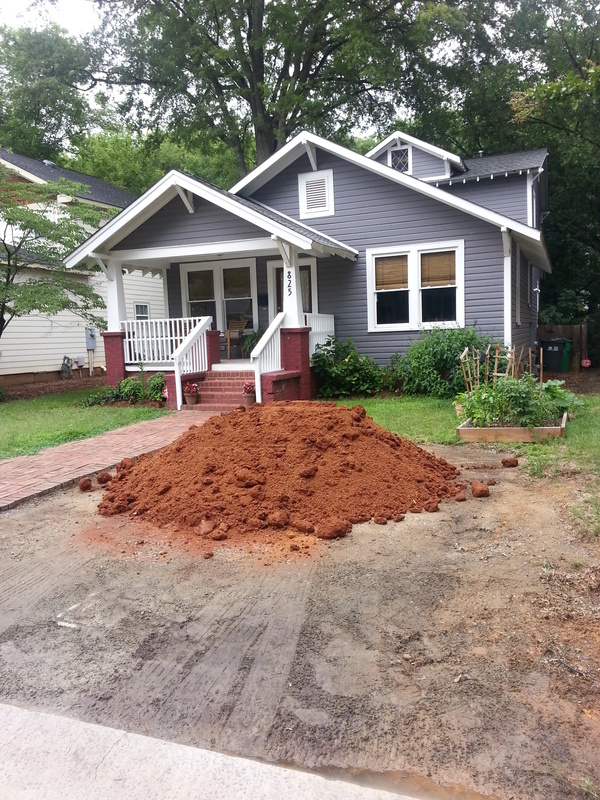 First, what was left of my gravel driveway had to go…. 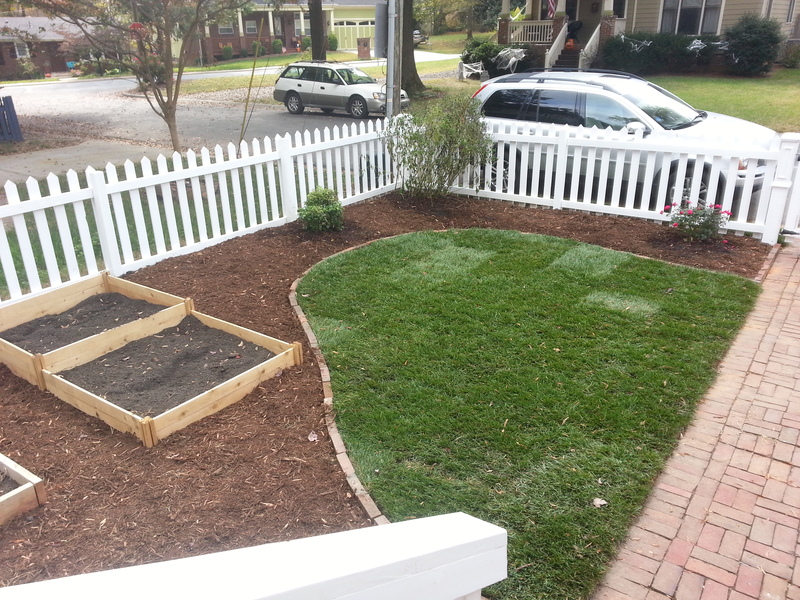 Once I had a gravel-free, some-what level surface, the fence guys were able to get to work. 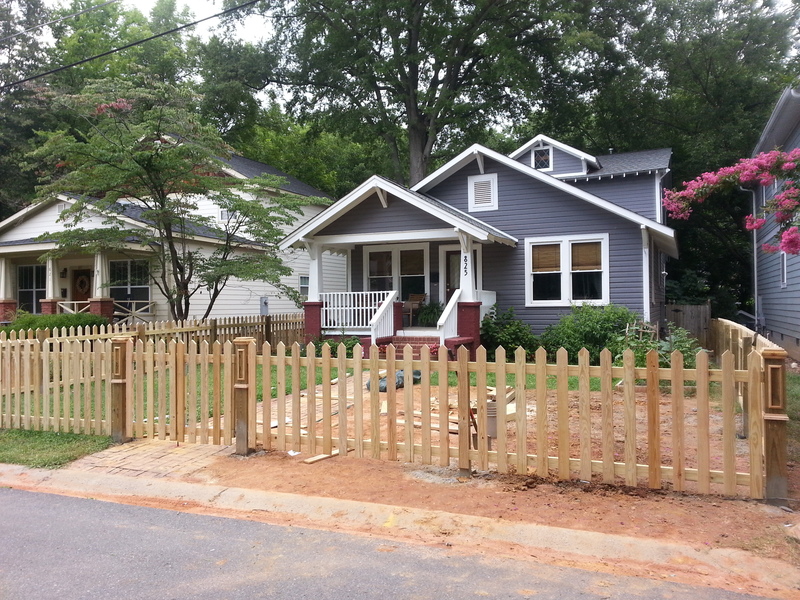 Crown Fence and their crew did an awesome job. 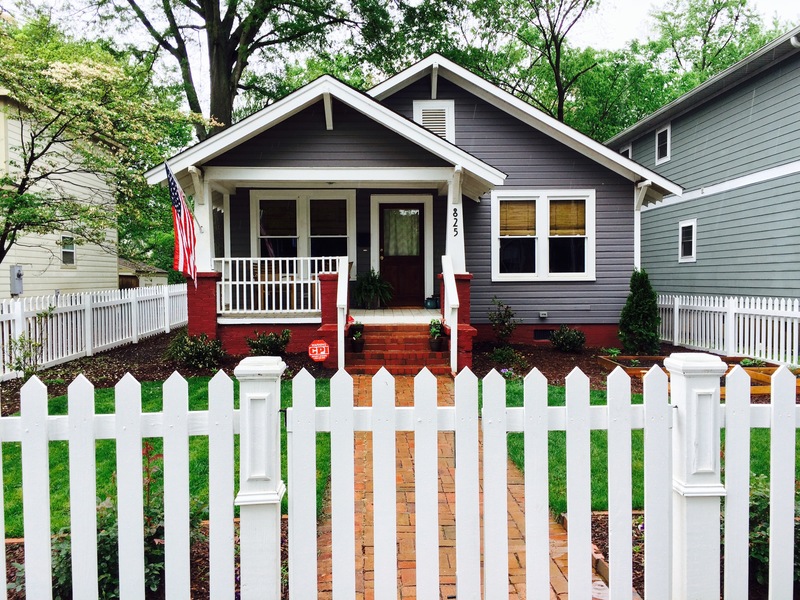 Owner Matt Brennan designed and built beautiful craftsman posts to anchor the picket fence. 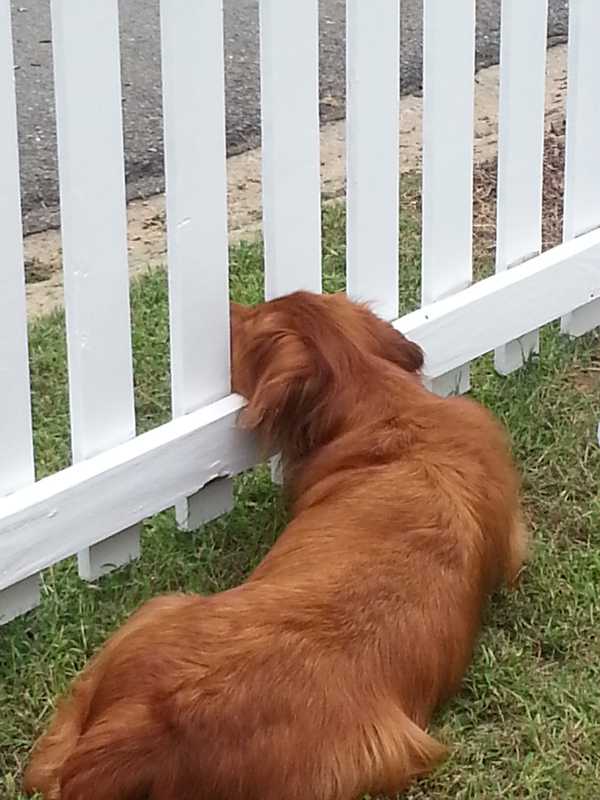 Painting a picket fence is tedious work! 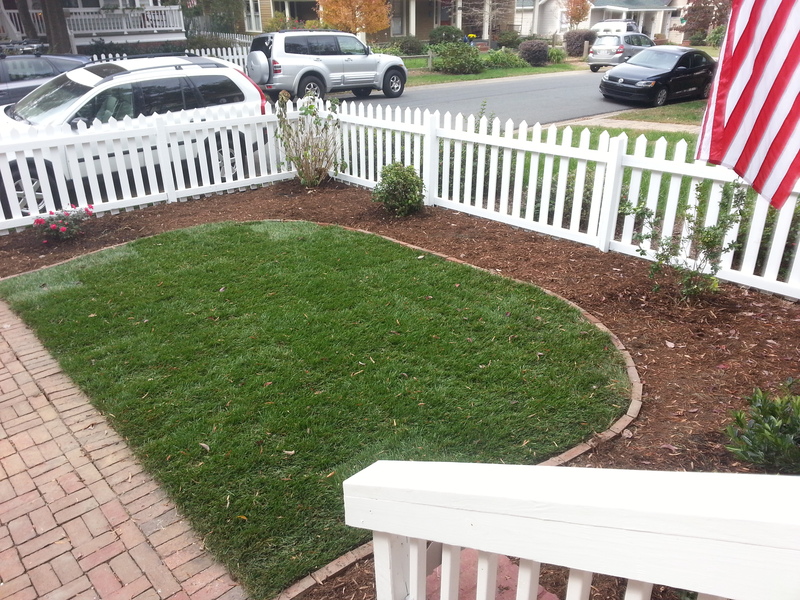 There’s a reason Tom Sawyer was sentenced to whitewash a picket fence as punishment. However, unlike Tom Sawyer, I wasn’t savvy enough to enlist help (and again, probably too stubborn to admit I needed it). So, I went over picket by picket, first with a primer, then with actual paint. 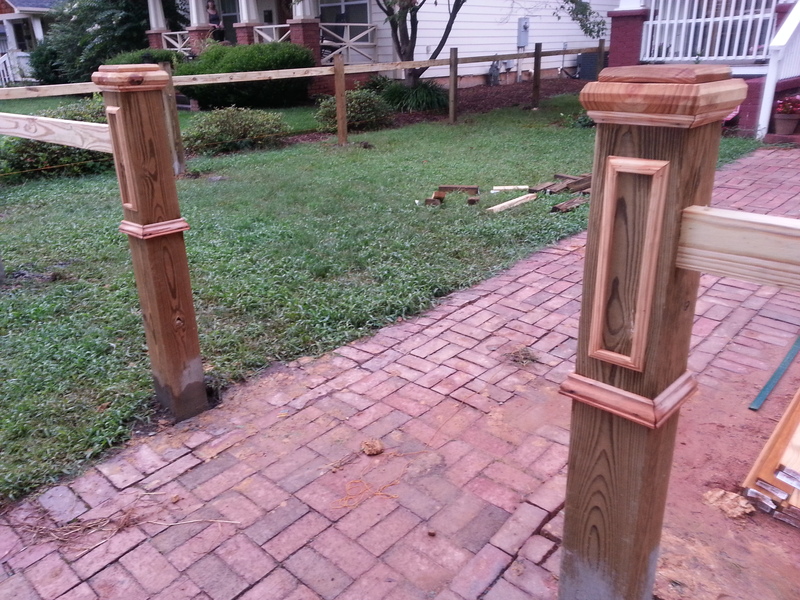 I would cover the majority of each picket with a small roller and later return with a brush to get the tight spots. Like each mile of a long run or race, I would focus on each current section of fence while painting then congratulate myself when I was able to move all my brushes, tarp and paint to the next – moving the chains was my mantra. Before you start sending me e-mails or leaving me comments about why I didn’t just use a paint sprayer, believe me, I tried! The first paint sprayer I rented from Home Depot flat-out did not work. After bringing it all the way home, messing around with it for about half an hour, I returned the junk and swapped it out for one that we tested (with water) in the store. With my new and improved paint sprayer (or so I thought), I returned home, filled ‘er up with paint, and flipped the ON switch. However, the thing turned on for half a second and then it shut off! I toggled the switch back and forth to try to revive the unit but no such luck. Then I realized…I bet….Yup, the paint sprayer tripped the breakers. So, after a trip of my own to the electrical panel, I tried again. Same thing. So, I took an extension cord and ran it in to my house and all the way to the back addition where I thought the electrical work may be a bit more sturdy, and finally! I had juice. Unfortunately though, I still did not have a working paint sprayer. Evidently my paint was too thick to move through the unit (yes, there was a paint strainer) so even after all my efforts, I could only spray a trickle of paint that was weaker than a kid’s squirt gun. Running water through the sprayer – worked great. Running actual paint through it – not so much. Half a day wasted and not a single picket painted, I returned faulty paint sprayer # 2 and vowed I would never rent another one again. 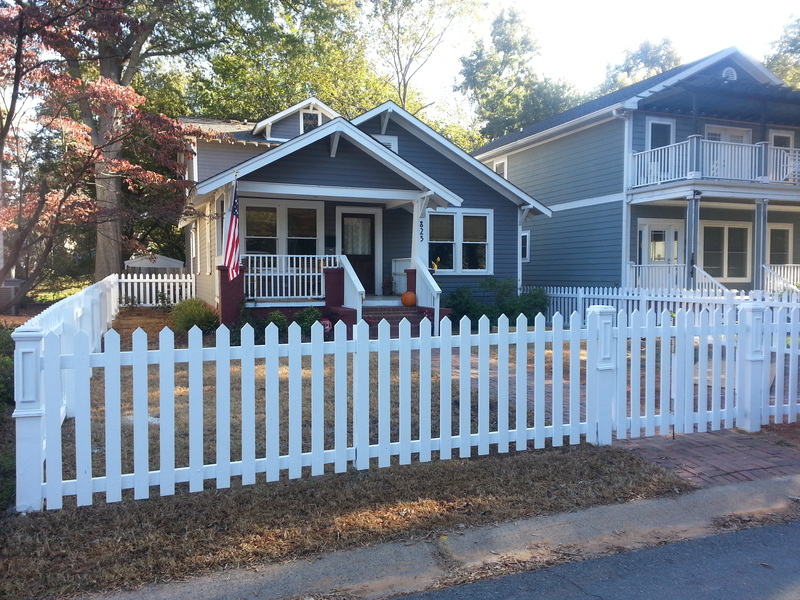 I started painting the picket fence in July, and I wish I could say I crossed the finish line and now have a perfectly-painted fence. The truth is that the clock ran out on me, and as Fall was drawing to a close, I had to take a break from the boredom and allow Darwin (isn’t that a cool name??) 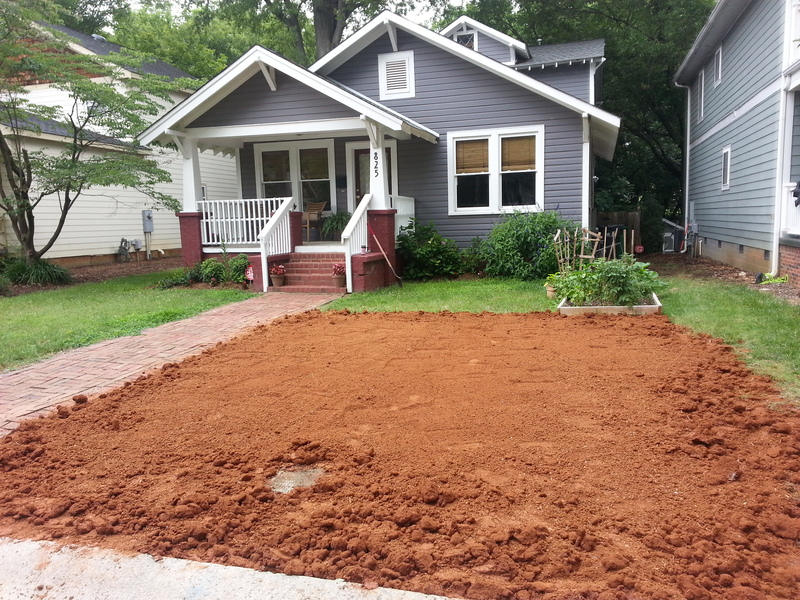 and his crew at Son Beam Lawn and Landscaping to put in some foundational plants and sod for me. While I don’t think any of my neighbors are actually aware of the fact that my painting job isn’t quite complete, I realize that painting a picket fence is a lot like yard work – there is no actual end to the job…Fortunately though, I’ve enjoyed the planting of an array of vegetables, herbs, and possibly an excessive amount of flowers (I’m quite likely going to have the girliest house on the block come blooming season) more than the painting. More pictures to come with (hopefully) the fruits, veggies and flowers of my labor. Let’s just hope these April showers bring May flowers! love what you’ve done!!! Hope to see it in person sometime soonish! It looks great PJ! I didn’t realize the painting wasn’t done either.